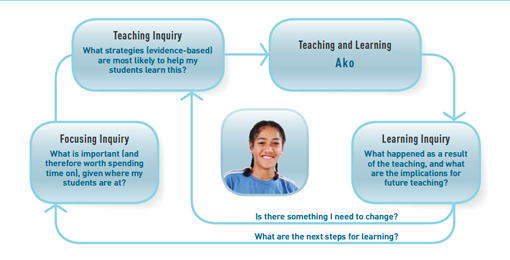 Graeme Aitken and Claire Sinnema developed this Teaching as Inquiry model as part of their work on the Social Sciences Best Evidence Synthesis. At a recent Education Hub seminar, Graeme said that Teaching as Inquiry was intended as an approach to practice and a basis for discussion and collaboration. It could also be a source of evidence for ongoing professional learning and appraisal. Teaching as Inquiry was influenced by the knowledge that teaching is an uncertain practice or craft. The complex world of the classroom is influenced by so many factors. Teaching as Inquiry was a model developed to help teachers navigate this complexity and adjust our practices to help our learners. It is not just about adapting curriculum but also adapting ourselves to our students. The development of Teaching as Inquiry was also influenced by other publications from the Best Evidence Synthesis series being compiled at that time. Quality Teaching for Diverse Students in Schooling: Best Evidence Synthesis Iteration [BES] emphasised the importance of focusing on student outcomes and using both research evidence and assessment information to improve teaching and learning. It also highlights the need to ensure that teaching is responsive to students’ learning processes. Teacher Professional Learning and Development: Best Evidence Synthesis Iteration [BES] confirms what many teachers had always suspected – that teacher learning is of crucial importance to student learning. Here at Lynfield College, a group of teachers including our Specialist Classroom Teacher of the time, Sarah Parker, trialled Teaching as Inquiry in 2011. The success of these trials saw it become a school-wide practice in 2012. Led by Lexie Ridling, Lynfield developed a strong culture of Teaching as Inquiry over the next few years. In those early years, the Faculty Leaders were very active in helping the inquiries relate to student achievement and classroom practice. Robinson and Lai argue that this is a key part of ensuring the quality of inquiry: “Teachers who are skilled in processes of inquiry can detect weaknesses in their own thinking about practice and help others to do the same.” (Practitioner Research for Educators, page 6). In 2017 Lynfield made the shift to all teachers taking part in collaborative inquiries. This reflected much of the emerging research around the power of collaborative inquiry. Kaser and Halbert (2009) state “Collaboration and Inquiry combined in a powerful way will improve student learning. Jane Gilbert and Derek Wenmoth in their thinkpieces for the Education Council both focused on how increasing the interactions between teachers, students and school leaders will increase our capacity for learning and improving. Graeme Aitken at the recent Education Hub Teaching as Inquiry seminar highlighted the point that Teaching as Inquiry was never intended as a solitary endeavour. This entry was posted in Uncategorized and tagged collaboration, collaborative inquiry, educational research, effective pedagogy, Lynfield College, New Zealand Curriculum, professional development, professional learning, spirals of inquiry, student centred learning, teaching as inquiry by stevemouldey. Bookmark the permalink. Teaching has always been tentative and ambiguous, but with a moral imperative, which can be a source of dissonance. 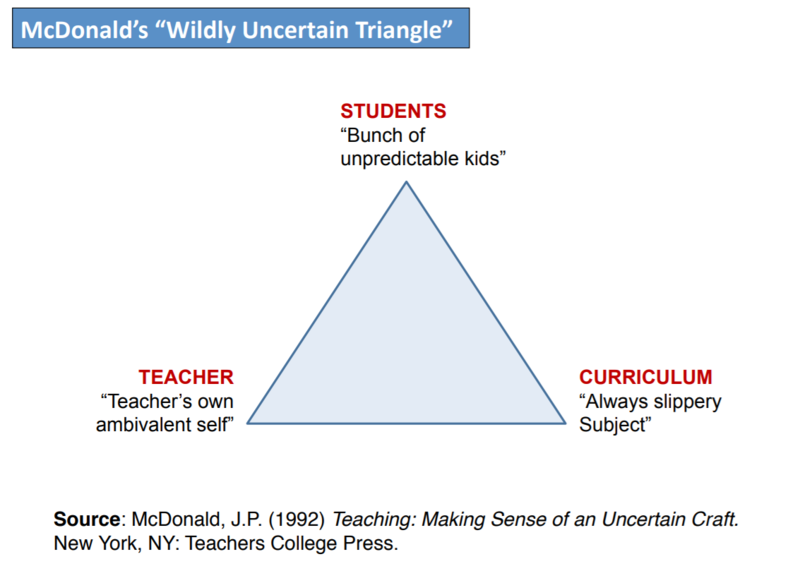 The McDonald triangle is very telling.